Take one Silverling and 2 worker tiles, plus a starting castle. Place the castle on any castle space on your player board (The A side is better for beginners, the B side for advanced players). Take 3 random goods and put them next to the board. 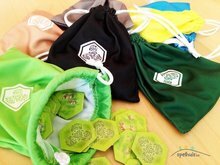 In solo game there is no restriction for the number of different types (= colors) of goods that you can collect. 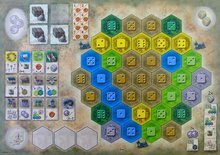 - Then remove a hex tile from that depot from the game, starting from the top to bottom (depots 2, 3, 4, 5 and 6) or left to right (depots 1 and 4) respectively. If a depot is empty, remove a hex tile from the next depot in clockwise order etc. In addition, you now (and only now!) have the option to exchange any 5 of your goods for a single tile from the black depot (the 5 goods tiles are removed from the game). Place that tile face down (i.e. it's black side up) on one of your three storage spaces. A "black tile" can be placed on any color space on your board, as long as you follow the base game placement rules. Placing a black tile helps you to complete a region (to gain victory points, a color bonus and for winning the game) but has no other effects. - You won't gain victory points as color bonus when completing a color. 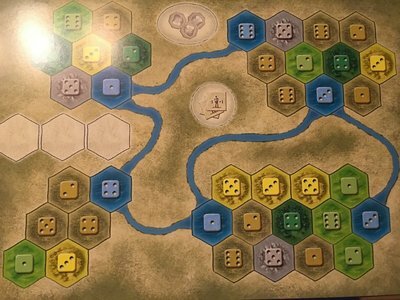 Instead, choose a tile from the black depot and place it directly on the board, with all his effects, following the base game placement rules. If that completes another color, take an additional tile from the black depot (if available), place it on your board, etc. When your victory point counter reaches the target victory point marker, put it back on space 0 (any remaining victory points are lost), then move the target marker down 5 space (e.g. from 50 to 45, next time to 40 etc). 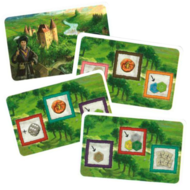 Immediately after resetting the victory point counter you may carry out a dice action of your choice (just as if you had added a castle to your estate). You win the game if you manage to occupy all 37 hex spaces of your estate within 25 rounds.